I’m so sorry about the day late recipes! My oven is broken, which has me re doing everything last minute. I hate that. 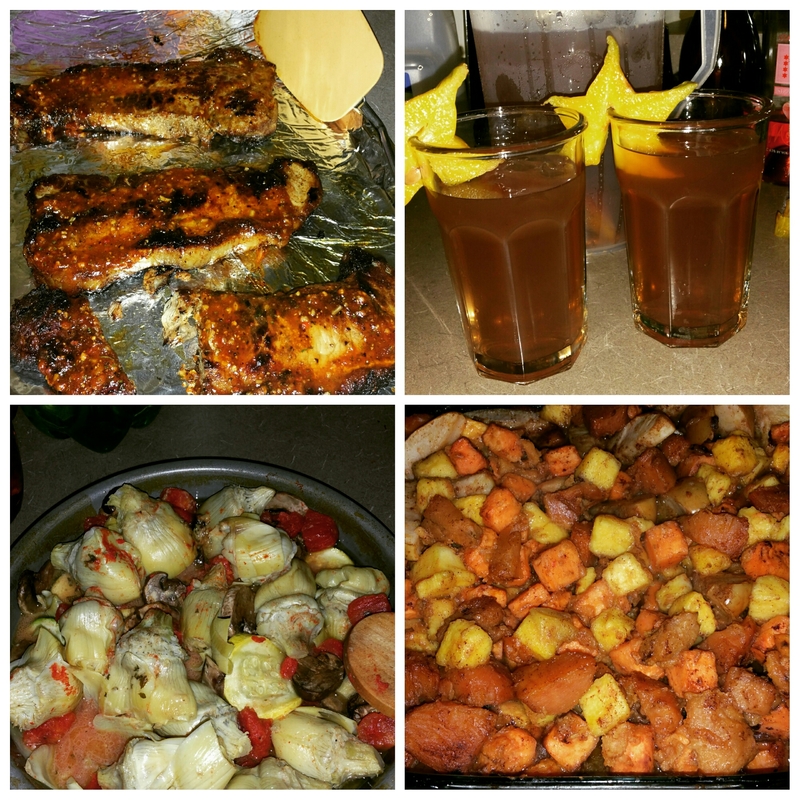 In any event, here’s the dinner we had today that is what I like to call ‘Plan B’. Now, if you guys remember, I love marinades, because it does all the work for me. The longer it sits, that juicer it is. Well in this case for the steaks, I didn’t do that. I used marinade yes, but didn’t let it sit over night like I normally do. I made stove top grilled steak. I used boneless steak, and caught a sale on those, which is awesome! Normally I’ve seen people use a cast iron pan, or griddle. We are on a budget, so I used a frying pan with butter. As I began to fry the steaks, I brushed the marinade on each side of the steak, every time I flipped the steak. 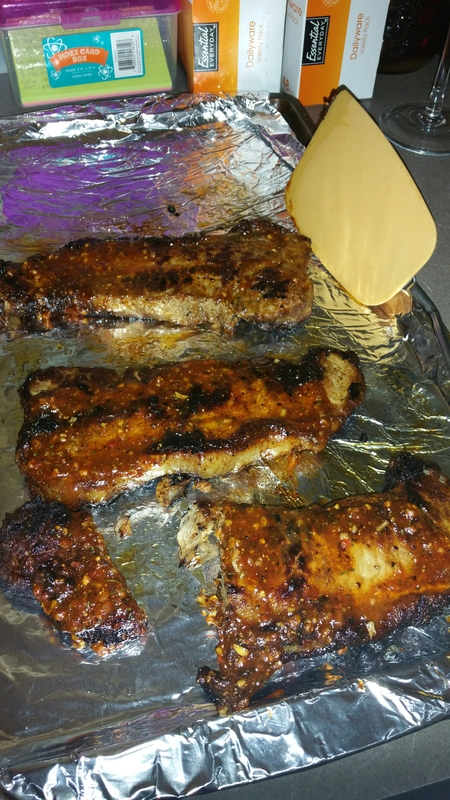 I used the brown sugar bourbon marinade from McCormicks. Just cooked it unti it was well done. If you want it to be rare, it doesn’t affect the method, just less time. Next was the sweet potato/apple/butternut dish. 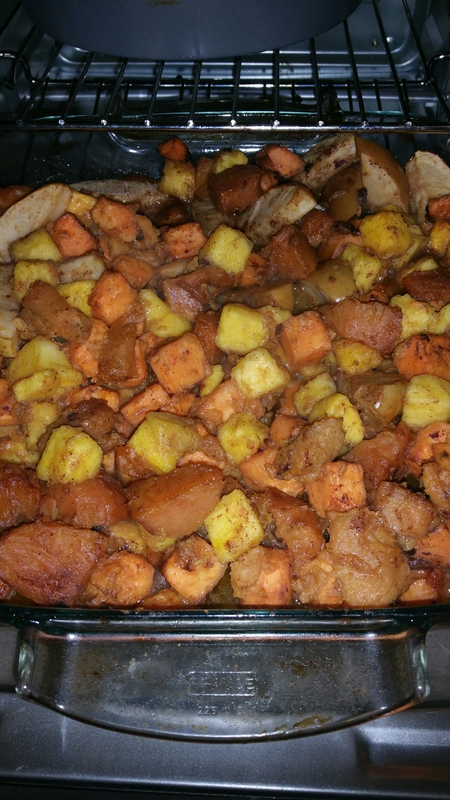 I used cubed sweet potatoes, canned yams, cubed butternut squash, and apple slices. Just used my apple slicer/corer to get the apples evenly sliced. I mixed it altogether in a glass casserole dish. 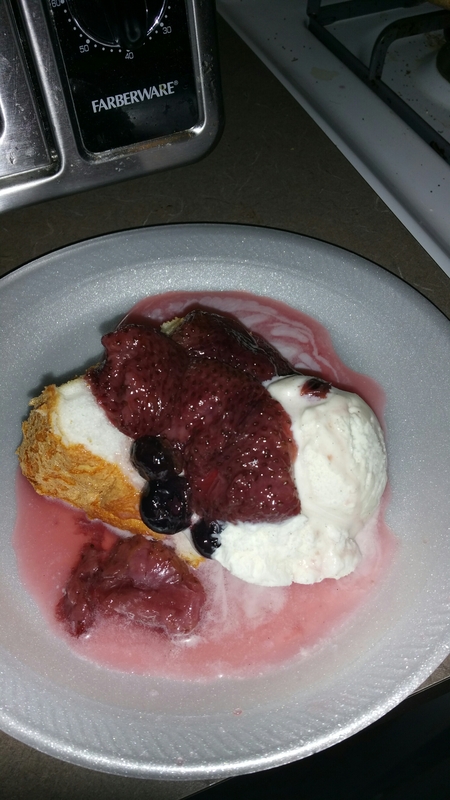 I then took half stick of butter, 3 tbsp sugar and cinnamon and melted it in the microwave. Bake at 375 until everything is soft. Took me three hours in a toaster oven, but it worked! Lastly the veggies. 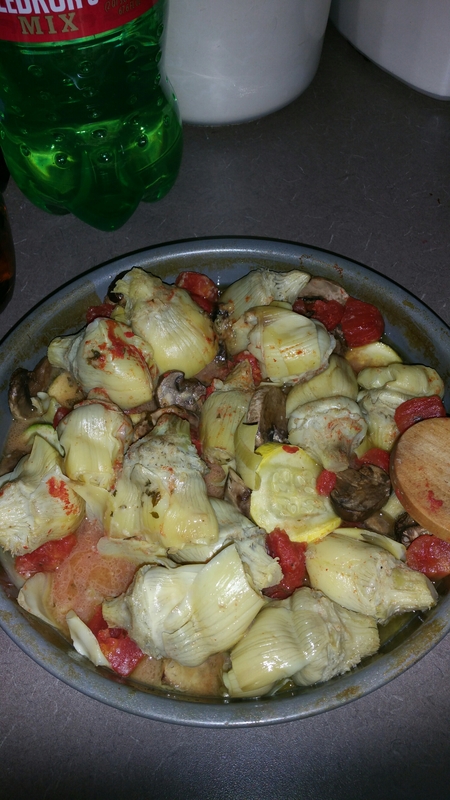 I combined canned artichoke hearts, diced tomatoes, sliced zucchini,and sliced mushroom in another casserole dish. I bought sauteed butter that you would normally saute veggies or whatever you choose in a pan. Instead I took those chunks, and evenly put them on top of the veggies, and baked them. Real simple. Most of this dinner you put together, and walk away. I again apologize for the last post, I’m about to get real ugly if my oven isn’t fixed soon, I have so much planned around it! I hope you guys enjoyed the recipes today, and I can’t wait for next Tuesday!